Notes: CMP. 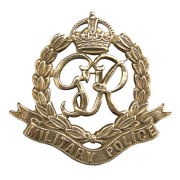 Enlisted in the Beds & Herts Regiment, transferred to CMP.. From Darlington. 20/10/43 5989073 Sgt Springham F H and 2654715 L/Cpl London J C injured by shellfire and admitted to hospital. 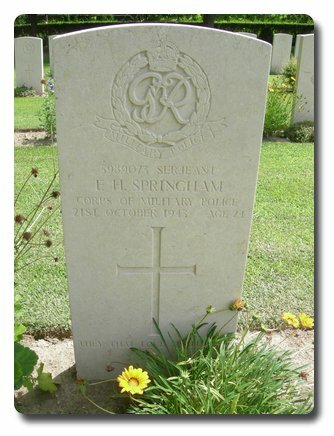 21/10/43 Sergeant Springham died in hospital owing to injuries. Unit War Diary 56 Division Pro Coy CMP. WO 169/8825. inscription on gravestone: They that love shall part. 18/11/43 Sgt Springham awarded MM immediate award. Unit War Diary WO 169/8825. Unit War Diary: 175 Company Ports CMP WO 166/16271. Honours and Awards: The following information has been received from the Provost Marshall, Allied Forces Headquarters:- "The following immediate award to a member of the Corps was made by General Sir Harold Alexander, GCB, CSI, DSO, MC on 12/12/43:- Military Medal 5989073 W/Sgt F H Springham, (died of wounds received in action). Frank Harold Springham. Citation: Italy. (died of wounds).